« Beau’s Oktoberfest is This Weekend! Autumn Hop Harvest Ale — Amsterdam Brewing Co.
Eat fresh; eat local. Right? How about drinking a beer made with hops picked the day it was brewed? 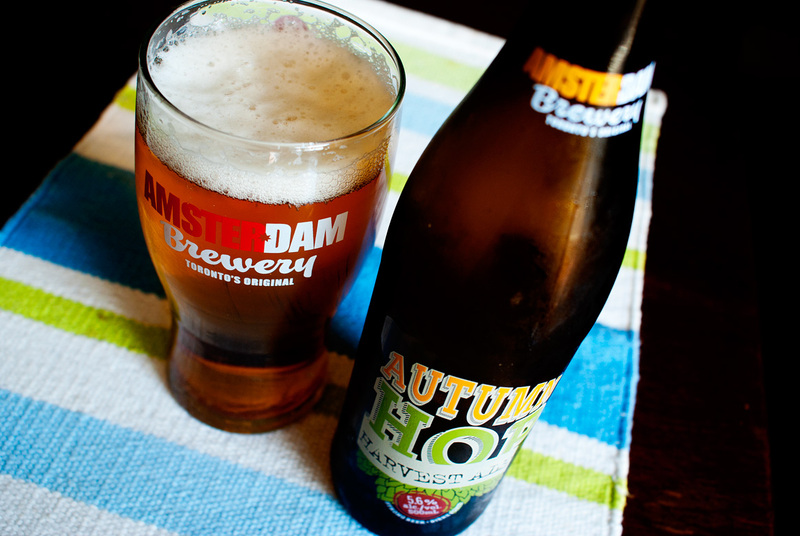 Amsterdam’s Autumn Hop Harvest Ale is exactly that, a “wet-hopped” pale ale. Wet-hopping is a term you may well have heard, if you’re a craft beer loyalist these days. And it’s a bit of a confusing term. The idea, I think, is that the hops aren’t dried and processed when they’re added to the brew, they’re still “wet”. Except dry-hopping isn’t the act of adding dry hops to a brew, as nearly all the hops added are dried, and generally processed into pellets, before brewing with them. Dry-hopping refers to adding hops to the secondary fermenter (or cask), and I assume it’s called dry-hopping because it should be a fairly dry process (compared to brewing). If you know what dry-hopping is, it’s easy to assume wet-hopping is the opposite. But it’s not. Now that we’ve dealt with that, and you know what wet-hopping is (using fresh from the bine hops), we can talk about Amsterdam’s wet-hopped harvest ale. The same day they brewed up this batch, a team headed out to the country to get fresh-picked cascade hops. A classic pale ale hop, known for being citrusy and spicy, it’s the backbone of many epic ales. From a 500ml bottle, Autumn Hop pours a brilliantly clear deep amber. A decent 2″ head drops to a fairly thick layer of foam that sticks around through the whole glass and leaves plenty of lace. Aroma is (unsurprisingly) big dank hops. Herbal, nearly minty and a little funky. There’s a touch of fruit, but it’s not a big shot of citrus like in an American-style pale. More like lemon curd, or something a little tart but mellow. It’s also a little grassy/floral and grainy. Hard not to let the name paint the picture in your mind, but I think of a grain field just before harvest. Mind you, I’m not certain I’ve ever actually smelled a grain field just before harvest, so who knows. It does smell lovely. Taste is more of the same, dank piney hops, spicy, with a bit of bitter fruitiness and flowers, and a delicate malty sweetness. The bitterness of the hops is actually bigger than I expected. It’s still in good balance with the malts, but is definitely in the American Pale Ale range. Often fall/harvest ales tend more towards the English/malt-forward pales, but this one puts those fresh Cascade hops on display. It’s easy to forget that Sierra Nevada (arguably) ignited the American Pale Ale revolution with lots of cascade in their pale ale, but it’s easy to see why. This is a lovely, complex, but very approachable pale ale. Cheers to the whole crew at Amsterdam! Available right now at both breweries, the LCBO (#337261/$4.95) and bars around the GTA. This is an interesting question. It would work well with a traditional turkey dinner, but maybe you should branch out this year. Instead of doing a whole bird in the oven (or better, on the BBQ), why not break it down (or just buy pieces), and do an adaptation on a jerk marinade/sauce? The spiciness and fruits in the beer will hold up well with the jerk flavours, and the bitterness will help cut the rich fatty poultry. For cheese, grab something goaty and rolled in herbs. I know Monforte does a goat’s cheese (or maybe sheep’s?) rolled in herbes de provance, which would be pretty good here. The Amsterdam Brewing Company is an independently owned and operated craft brewery that is deeply rooted in the city of Toronto. A pioneer of the craft beer revolution in 1986 and initially called the Amsterdam Brasserie and Brew Pub, The Amsterdam was the first of its kind in Toronto to offer patrons hand crafted lagers and ales that were brewed ‘in-house’. Today they brew over ten different beers including their flagship lager – Amsterdam Natural Blonde, the award winning Big Wheel Deluxe Amber, Boneshaker IPA and multiple year-round and seasonal brews. The Amsterdam Brewing Company uses only traditional brewing methods and their beers are made with four all natural ingredients – malt, hops, yeast, and water. All beers are GMO-free, without preservatives, and never heat pasteurized. Anyone else find the 2015 Autumn Hop offering less hoppy than last year’s? Last year’s batch was hazy, resinous and fully aromatic and this year’s beer is clear, no fresh hop flavour to speak of, muted aromas and tastes like a standard ale… hate to speak poorly about local craft brews/brewers but not sure if my palate has shifted since having it in 2014..
Hey Hopportunistic, thanks for commenting, and no worries, I don’t think you’re being unreasonable or unnecessarily mean. First, and you’ve touched on this, tastes do change, especially with beers that are only seasonally available, though I don’t think that’s the main factor here. Secondly, the reality of doing a fresh hop beer, is that you really don’t know what you’re going to get. The hops get checked before harvest, but processed hops get checked and their alpha/beta contents are noted, and in pelletized hops, they’re made to be consistent across the batch. I suspect at least part of your trouble with this year’s batch is probably related to this. Lastly, the clarity is very possibly because Amsterdam now has a centrifuge that they use to help clarify their hoppier beers without filtering out lots of the good stuff (and also to make filtering easier on their filtered beers). It’s unlikely that that has stripped out any flavours, but if they used it on this batch, it’s hard to over-emphasize how much you taste with your eyes. And if you’re used to cloudy = hoppy, a clear beer can taste flatter, even if it’s not.